The South Sandwich plate (SAN) is an oceanic microplate of approximately 180000 km2 located 1500 km North-East from the Antarctic Peninsula. The SAN plate is bounded to the west by the East Scotia Ridge and to the east by a subduction zone. To the east and west are located the Scotia plate and the South American plate (SAM) , respectively, with the Antarctic plate to the south. The SAN plate is located approximately between 55°S and 60°S in latitude, and between 24°W and 30°W in longitude. Figure 1. Relative motions of the plates surrounding the South Sandwich plate. Modified from (Fretzdorff et al. 2002). The SAN plate is composed of oceanic lithosphere that forms from the east side of the East Scotia Ridge (ESR), a back-arc spreading center that sets the western boundary of the plate. To the east, the plate is bounded by the South Sandwich trench formed by the subduction of the South American Plate beneath the South Sandwich plate (Pearce et al. 1995). These boundaries along with relative plate motions are shown in figure 1. The overall motion of the SAN plate relative to the surrounding plate is eastward. This motion combined with the westerly motion of the South American plate gives rise to the convergent boundary forming an intra-oceanic subduction zone with the SAM plate being subducted under the SAN plate. At this convergent boundary, the SAM plate effectively tears in order to have a portion of the plate subduct under the South Sandwich plate, as shown in figure 2. The SAM plate is subducting under the SAN plate at a rate of 69-78 mm/yr (Livermore et al. 1997). Figure 2. The South American plate tears in order to subduct under the South Sandwich plate. The red arrows identify the plates, with the striated plate representing the SAM plate and the transparent outline representing the SAN plate. Blue arrows indicate relative plate motion. Modified from (Forsyth 1975). Figure 3. Spreading segments (E1 to E9) of the East Scotia Ridge (Thomas et al. 2003). (Thomas et al. 2003) (Livermore et al. 1997). The spreading rate is determined by studying the polarity reversals in the seafloor magnetic profile of the plate, in particular the Brunhes-Matuyama reversal, a recent polarity reversal that occurred 0.79 Mya (Johnson 1982) . Although similar in nature to a mid-ocean ridge, a back-arc spreading center is formed as the direct result of subduction. 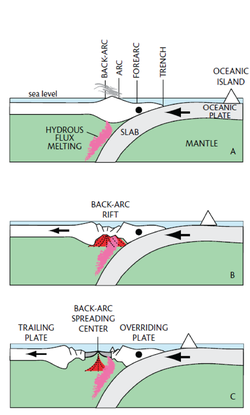 Several mechanisms for the creation of back arc basins have been proposed (see the Current Tectonics: Types and Causes of Rifting page for a discussion of back arc extension). A mechanism proposed for spreading of the East Scotia ridge is regional extension caused by slab rollback (Leat et al., 2000) . The resulting thinning of the over-riding plate allows the upwelling of decompression melt magma (figure 4 C) creating new oceanic lithosphere (Martinez et al. 2007). The rollback force is generated by the negative buoyancy of the dense subducting slab. This creates a downward pull on the slab and a bending moment that loads the plate and results in the migration of the trench away from the arc, giving rise to local extension at the back arc spreading center (Heuret & Lallemand 2005). Figure 4. A. Hydrous flux melting of the wet subducting slab creates the volcanic arc. B. Slab rollback extends the overriding plate behind the arc. C. Decompressional melting creates upwelling of magma at the spreading center (Martinez et al. 2007). The South Sandwich volcanic arc is composed of eleven main islands. Five of the islands have been volcanically active in the past 100 years (Leat et al. 2013). In addition, there are a number of submarine volcanoes with the significant explosive eruption of the submarine volcano ’Protector Shoal’ in 1962 (Leat et al. 2013). The islands are composed primarily of basalt with a composition between a mid-ocean ridge basalt and a tholeiitic basalt (a basalt high in magnesium and iron) (Pearce et al. 2000). Based on radiometric dating, the islands formed approximately 5 Mya (Pearce et al. 1995). The South Sandwich Trench is located to the east of the South Sandwich volcanic arc where the SAM plate subducts under the SAN plate. The majority of earthquakes associated with the South Sandwich plate occur at the South Sandwich Trench (Thomas et al. 2003). Faccenna, C., Davy, P., Brun, J. P., Funiciello, R., Giardini, D., Mattei, M., Nalpas, T., 1996. The dynamics of back‐arc extension: An experimental approach to the opening of the Tyrrhenian Sea. Geophysical Journal International, 126 (3), 781-795. Forsyth, D. W., 1975. Fault plane solutions and tectonics of the south atlantic and scotia sea. Journal of Geophysical Research, 80 (11), 1429–1443. Fretzdorff, S., Livermore, R. A., Devey, C. W., Leat, P. T., Stoffers, P., 2002. Petrogenesis of the back-arc East Scotia Ridge, South Atlantic Ocean. Journal of Petrology, 43 (8), 1435-1467. Heuret, A. Lallemand, S., 2005. Plate motions, slab dynamics and back-arc deformation. Physics of the Earth and Planetary Interiors, 149 (1), 31-51. Johnson, R., 1982. Brunhes-matuyama magnetic reversal dated at 790,000 yr bp by marine-astronomical correlations. Quaternary Research, 17 (2), 135–147. Leat, P., Livermore, R., Millar, I., Pearce, J., 2000. Magma supply in back-arc spreading centre segment e2, east scotia ridge. Journal of Petrology, 41 (6), 845-866. Leat, P., Pearce, J., Barker, P., Millar, I., Barry, T., Larter, R., 2004. Magma genesis and mantle flow at a subducting slab edge: the south sandwich arc-basin system. Earth and Planetary Science Letters, 227 (1), 17–35. Leat, P. T., Day, S. J., Tate, A. J., Martin, T. J., Owen, M. J.,Tappin, D. R., 2013. Volcanic evolution of the south sandwich volcanic arc, south Atlantic, from multibeam bathymetry. Journal of Volcanology and Geothermal Research, 265, 60–77. Livermore, R., Cunningham, A., Vanneste, L., Larter, R., 1997. Subduction influence on magma supply at the east Scotia ridge. Earth and Planetary Science Letters, 150 (3), 261–275. Livermore, R., McAdoo, D., Marks, K.,1994. Scotia sea tectonics from high-resolution satellite gravity. Earth and Planetary Science Letters, 123 (1), 255–268. Martinez, F., Okino, K., Ohara, Y., Reysenbach, A., Goffredi, S., 2007. Back-arc basins. Oceanography Washington D.C.-Oceanography Society, 20 (1), 116. Müller, C., Bayer, B., Eckstaller, A., Miller, H., 2008. Mantle flow in the south sandwich subduction environment from source-side shear wave splitting. Geophysical Research Letters, 35 (3). Pearce, J. A., Baker, P. E., Harvey, P. K., Luff, I. W.,1995. Geochemical evidence for subduction fluxes, mantle melting and fractional crystallization beneath the south sandwich island arc. Journal of Petrology, 36 (4), 1073–1109.